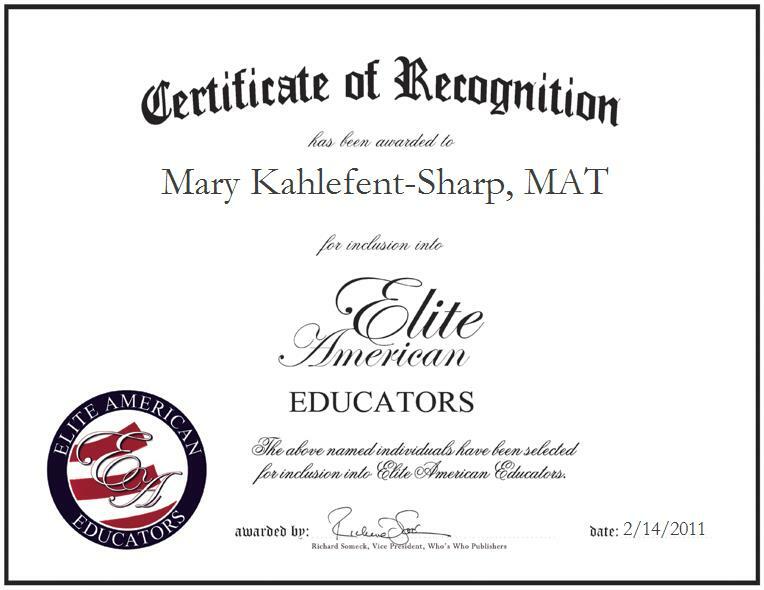 Riverside, CA, February 14, 2011, Mary Kahlefent-Sharp, Teacher for Jurupa Unified School District, has been recognized by Elite American Educators for dedication, leadership and achievements in elementary education. Sustained by a long-standing passion for educating young children, Ms. Kahlefent-Sharp has devoted the last 38 years to teaching. She lends her talents to Pacific Avenue Elementary School, where she implements an individualistic curriculum that takes into account the particular talents, capacities and interests of each of her students. Ms. Kahlefent-Sharp is grateful for the longevity that she has enjoyed in the field of education, and attributes it all to God’s guidance. Ms. Kahlefent-Sharp completed postgraduate coursework at the University of California, the University of La Verne, Loyola Marymount University, and California Baptist University. She obtained a Master of Arts in teaching from Grand Canyon University, a Bachelor of Arts in music from California State University, and an Associate of Arts in general studies from Riverside Community College. She earned a teaching credential in 1973 from California State Polytechnic University, Pomona. An esteemed member of her profession, Ms. Kahlefent-Sharp was honored with inclusion in Who’s Who among American Teachers from 2004 to 2007. She maintains active affiliation with the California Teachers Association, the National Education Association and Pi Lambda Theta. When she is away from her professional duties, Ms. Kahlefent-Sharp enjoys singing and doing volunteer work. She names her local church and United Way Worldwide as her favorite charities.